On January 26, 2016, LBPD Economic Crimes Detectives began a fraud investigation against Elizabeth Mulder, a resident of Laguna Beach, after a local business owner identified Mulder as his accountant and alleged that Mulder embezzled $200,000 from his wine business, JAC Wines. The investigation revealed that between July 2009 and May 2016, Mulder devised and executed a scheme to defraud and obtain money from small businesses by gaining the trust of their owners, some of whom allowed her to gain control over their financial accounts. In total, Mulder embezzled over $1.5 million from her victims, according to documents filed in federal court. When sentenced, Mulder faces up to 23 years in prison. Among her victims was JoAnn Kurtz-Ahlers, president of Kurtz-Ahlers & Associates, an upscale travel agency based in San Juan Capistrano. Kurtz-Ahlers tells StuNewsLaguna that she thought everything was going smoothly during the five years, 2011 – 2016, that Elizabeth Mulder acted as her accountant, primarily handling income tax issues for Kurtz-Ahlers’ upscale travel agency. Then Kurtz-Ahlers found out that all the money she thought she’d paid to the IRS had disappeared into Mulder’s pocket. Along with the shock of realizing her funds had been embezzled, Kurtz-Ahlers still has to deal with IRS. They expect Kurtz-Ahlers to pay what she owed for those five years – plus penalties and fines – and it is taking a great deal of negotiation to come to a settlement with the IRS. But Mulder was in the process of embezzling what would turn out to be 1.5 million dollars from clients who trusted her. She was good at what she did – except her skill was in theft. Search warrants executed by LBPD Detectives at the Mulder residence and her bank accounts revealed additional victim businesses throughout Orange County. These companies included Toni & Guy Hair Salon (Newport Beach), Kurtz-Ahlers LLC (San Juan Capistrano), Bella Pilates (San Clemente), Andra Builders, Inc. (Costa Mesa), and California Print 2 Copy (Irvine). Mulder deceived clients into making checks payable to a phony business she created called “Income Tax Payments,” under the guise that those payments would satisfy the clients’ outstanding IRS tax obligations. She also created false personas as representatives and/or investors of companies to lead her clients to believe various expenses were being paid for the benefit of the business. “This investigation serves as a reminder that our police department will pursue individuals in positions of trust who take advantage of innocent victims. We brought in every available resource, including our partners from the Federal Government, to ensure that this case would be appropriately prosecuted and justice would be served,” said Captain Jeff Calvert, LBPD. Mulder used the money embezzled from the victims for a variety of personal expenses including a rental home in Laguna Beach, cosmetic surgery, personal vacations, living expenses, horse rentals and the purchase of horse equipment. This case was investigated by the Laguna Beach Police Department Investigations Division, with assistance from the Federal Bureau of Investigation, the IRS Criminal Investigation, and the United States Attorney. The Fire Department has been busy this week. On Wednesday, June 8, at 2:57 p.m., the Department received a call from the 600 block of Diamond Street. A construction worker had fallen from a construction site. The lack of stairs made it impossible to reach him other than by helicopter, and moving the patient was critical due to the extent of his injuries. The Fire Department, working with the OC Fire Authority, was able to hover and then drop someone down to rescue the patient and deliver him to Mission Hospital. Then on Thursday morning at 9 a.m., golfers at The Ranch at Laguna Beach reported hearing calls for help from a steep hillside. Access to the person was impossible by foot and the patient was unable to move due to a foot injury. Working again with the OCFA, Laguna Beach Fire Department deployed a “short haul” approach to airlift him to the hospital in Mission Viejo. 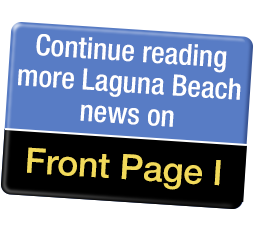 Laguna Beach Police were alerted to a stolen vehicle located at Forest Avenue and Laguna Canyon Road. The driver, Juan Gutierrez, chose to flee in the vehicle through the downtown area without stopping. The vehicle ultimately headed north to Newport Beach. With the assistance of Newport Beach PD, the vehicle was disabled utilizing Spike Strips. Three occupants were detained and two were arrested. They were Gutierrez and Arriaga. Gutierrez was also in possession of approximately one gram of methamphetamine.